Words by BRAD RHINES. Production photos by ERIC GREMILLION. Andrew Vaught is dropping some history. We’re chatting at a French Quarter bar over handcrafted cocktails, and Vaught touches on subjects like Franklin D. Roosevelt’s plot to kill Huey P. Long, the Battle of Liberty Place and its controversial commemoration, and the New Orleans streetcar and dock worker strikes of the early 20th century. Vaught gets particularly excited talking about the Federal Theatre Project, the WPA-era endeavor that was funded by the government until it was abruptly shut down for promoting anti-government sensibilities. “I think so many leftists look at the Great Depression and they’re like, ‘Those were the days!’” says Vaught, laughing at both the absurdity and the truth of his observation. Vaught, it’s worth noting, it drinking an Old Fashioned. Inspired in part by the Federal Theatre Project, Vaught co-founded Cripple Creek Theatre Company in New Orleans in 2006. He believes that art and activism go hand-in-hand, and it’s Cripple Creek’s mission to use theatre as means of addressing contemporary issues. Born and raised in Covington, Louisiana, Vaught is particularly attuned to issues affecting coastal Louisiana, which inspired him to write the company’s newest production, Possum Kingdom. Possum Kingdom is being presented in collaboration with the Louisiana Bucket Brigade, a non-profit organization that rails against the damage done by chemical and oil companies in South Louisiana. The play is a bayou fairy tale that hones in on a group of characters living in the swamp and making a meager living collecting Brosia, a mythical substance that they sell to the city-dwellers upriver. As the Brosia becomes scarce and their existence threatened, the characters are forced to reconsider their relationship with nature and the consumers who profit from their labor. The story is an impressionistic fantasy, but the allegory is plain, as Vaught attempts to address the complicated links between coastal residents, oil and chemical companies, and the precious resources that drive the economy and existence of the place. In the play, as in real life, there are no simple solutions or easy answers to untangle the long history of economic necessity intertwined with health and environmental dangers, but Vaught hopes that Possum Kingdom presents the possibility of engagement through the Bucket Brigade. 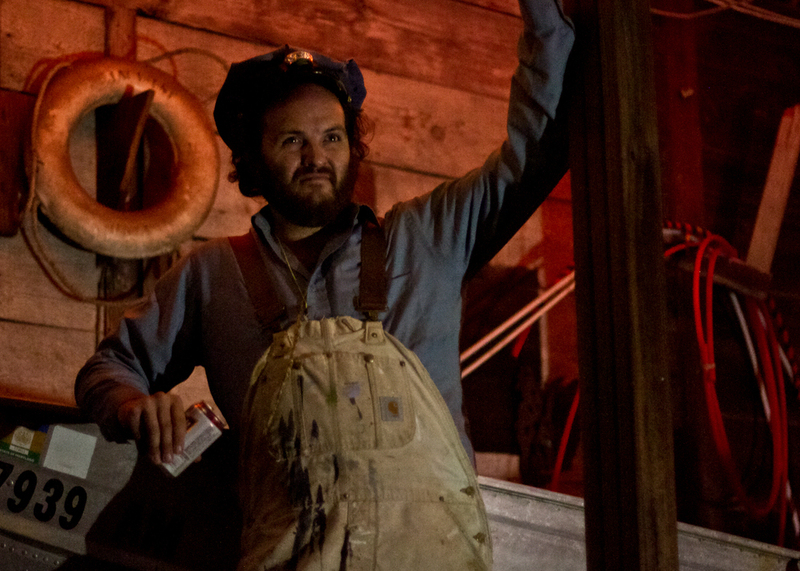 Andrew Vaught in character as Inman. Specifically, Possum Kingdom is presented as part of the Bucket Brigade’s Down By the River project, an effort led by Kristen Evans, the organization’s Art-to-Action Coordinator. Their aim is to reveal the past and present history of the swath of land along River Road between Baton Rouge and New Orleans. Once the home of large sugarcane plantations, much of the land is now taken over by chemical plants and oil refineries, with small rural communities wedged in between industrial sites. In 1811, those plantations were the site of the largest slave rebellion in U.S. history. The uprising started roughly 30 miles upriver of New Orleans, freeing slaves and burning plantation houses along the way, before being quelled just outside the city. Down By the River draws a parallel to the resistance of 1811 and the contemporary struggle for environmental justice along the same stretch of coastline now known as “Cancer Alley,” where poor residents are fighting to be relocated at the expense of industrial companies. Possum Kingdom draws from Louisiana's history of resistance as characters are faced with hard choices that pit their loyalty to each other against their loyalty to those who control the purse strings. It’s a beautifully executed work. Performed at a wooded outdoor venue off of St. Claude Avenue, the play’s action takes place under the night sky and amidst a copse of trees. 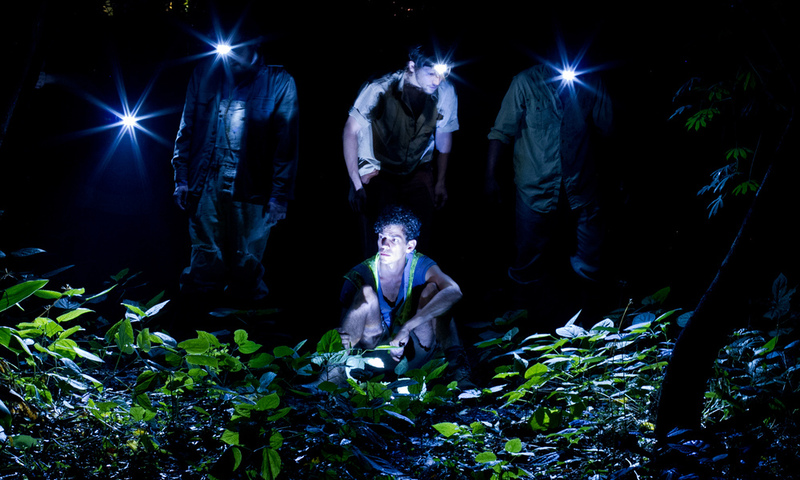 Creative staging gives a sense of the river just out of sight, and the actors wear headlamps to illuminate their faces. The soundscape of the play includes the sounds of the neighborhood, from train whistles to airplanes flying overhead, underlining the sense of isolation from a modern world that’s just out of reach. The spectacle of Possum Kingdom is immersive, which helps engage audiences with the characters and their story. The Bucket Brigade is taking a similar approach with Down By the River by hosting bike tours and gathering oral histories to give people a true sense of what’s happening to the people in these often overlooked communities. Vaught acknowledges that “raising awareness” isn’t the same as solving problems, but he believes that art can potentially provide the agency for those who need a push to get involved at the next level. Possum Kingdom has three shows each weekend now through November 10 in New Orleans, LA and then three shows Nov. 15-17th at the Bayou Playhouse in Lockport, LA. Visit the Cripple Creek website for full details and ticket info. Brad Rhines writes and lives in New Orleans. Follow him on twitter.